Wow! 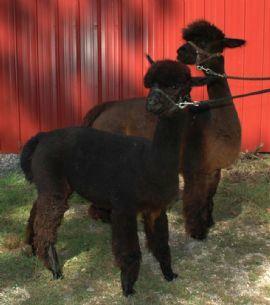 Dark Knight a gorgeous full Peruvian true black male out of two imports, 5Peruvian Camelot and 6Peruvian Gabriela. Dark Knight was named Grand Champion at the New York Empire Extravaganza 2002 against formidable competition. 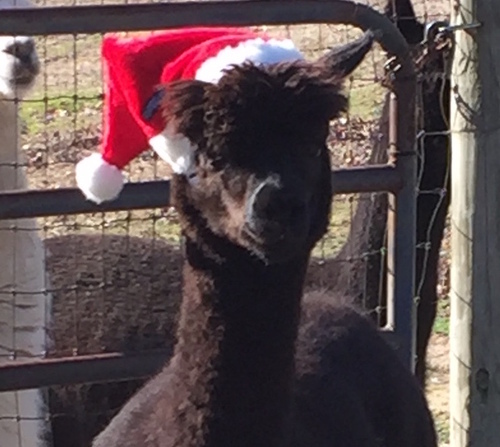 Judge Maggie Krieger announced that he is the epitome of what an alpaca should look like. 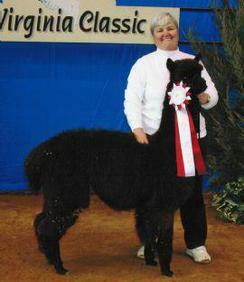 His beautiful true black color and ultra fine, crimpy fiber are so difficult to find on a true black animal. After 8 male crias in a row, we finally got our first female and wow, what a special girl she is! True black, shiny, soft and full of personality Tess is a special member of our herd. Her dam is Luc's Baroness, a Dom Lucilio daughter with a Chilean dam. Her sire is color champion Dark Knight. She is everything we hoped for from this breeding - color and fiber - and the judges have agreed. 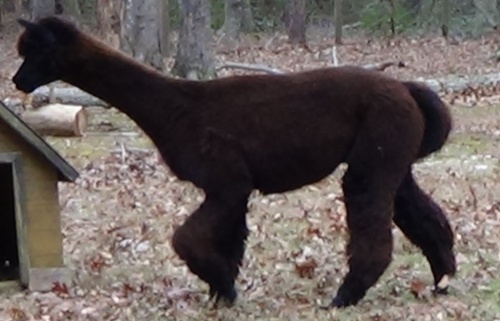 Her first cria was a soft, active, friendly guy who is true black, sired by Sunset Field's Knight of Camelot who brought fineness and consistency to his offspring. Tess is an easily handled, friendly member of our herd with a steady temperament. 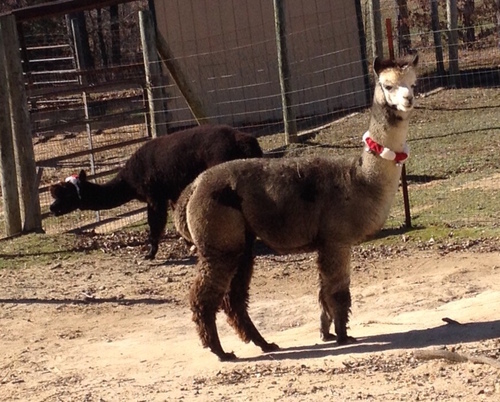 Her 2013 cria is a beautiful, soft silver grey female sired by our HDF hunter. We love this "Baroness line" - black or grey soft fleece and wonderful temperaments. She comes with a breeding to any of the herdsires we fully or partially own. We do mobile breeding within 75 miles, too.